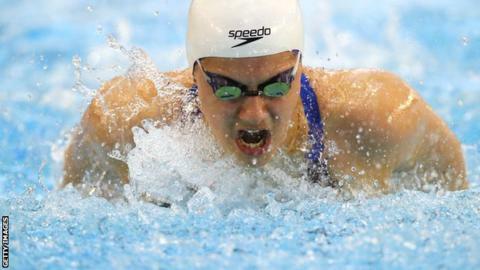 Middlesbrough's Aimee Willmott believes a more relaxed approach to swimming has been a key part of her 2014 success. She won silver in the 400m freestyle and 200m individual medley too, plus a fourth place in the 200m breaststroke. "For the first time in a while I haven't put pressure on myself," Wilmott told BBC Tees. Willmott not only won two golds at the British Championships, she also earned personal bests for the Long Course 200m Individual Medley and Long Course 400m Individual Medley events. "I'm enjoying racing and I now think 'that was good' or 'I'll do better next time' rather than doing badly and it being the end of the world." In addition, the Teessider has been able to put external pressures to one side and focus on her own performances. "I don't think of the pressures people are putting on me," she added. "I swim for myself, and I know what I want to achieve when I get into the pool. "Sometimes I don't tell people around me what I'm thinking because then if you don't do it they're asking if you're happy about things. "For me I set targets for myself then whether I achieve them or not I know if I'm happy with the swim or not."